Let me start with a list of players and coaches who either turned down my requests for balls or flat-out ignored me: Chad Bradford, Billy Wagner, Aaron Heilman, Guillermo Mota (cursed at me), Roberto Hernandez, Oliver Perez, Dave Williams, Mike DiFelice, Tom Nieto, Lastings Milledge, Shawn Green, Willie Randolph, Sandy Alomar Sr., Manny Acta, Jerry Manuel, Rick Down, Miguel Cabrera, Joe Girardi, Yusmeiro Petit, Renyel Pinto, Reggie Abercrombie, Chris Aguila, Jeremy Hermida, Perry Hill, Bobby Meacham, and Jim Presley. 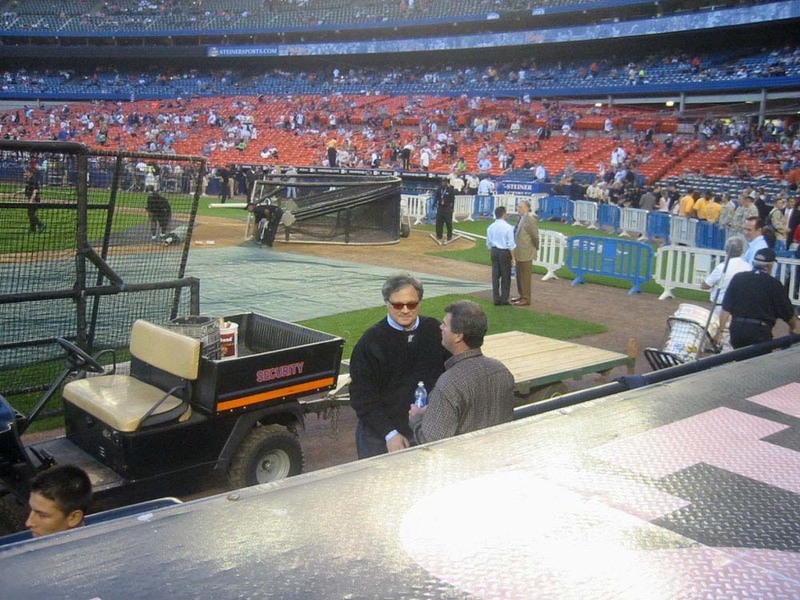 And now, the guys who DID toss me balls: Guy Conti, Orlando Hernandez, and Marlins owner Jeffrey Loria. The Conti ball was as simple as it gets. It was batting practice. I called down from the right field Loge. He tossed it up. The El Duque ball was fun. He had just finished a bullpen session and had several balls in his glove. I asked politely if there was any chance that he could spare one. It was hard to see the balls, not only because I was 30 feet up, but because I’d been to my eye doctor hours earlier and gotten some drops in my eyes (glaucoma test) that blurred my vision slightly for most of the afternoon. I was looking for commemorative logos, but all the balls pretty much looked the same. I couldn’t make up my mind. El Duque was getting impatient. I didn’t want to lose my chance. 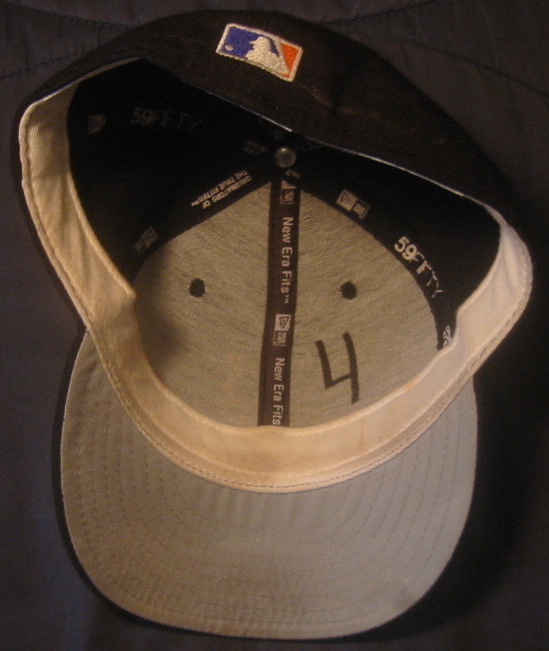 “Number one” seemed to have a hint of yellow in the stitching, which meant it was probably one of those stupid unmarked All-Star balls from 2004. “Number four looks pretty good!” I shouted. 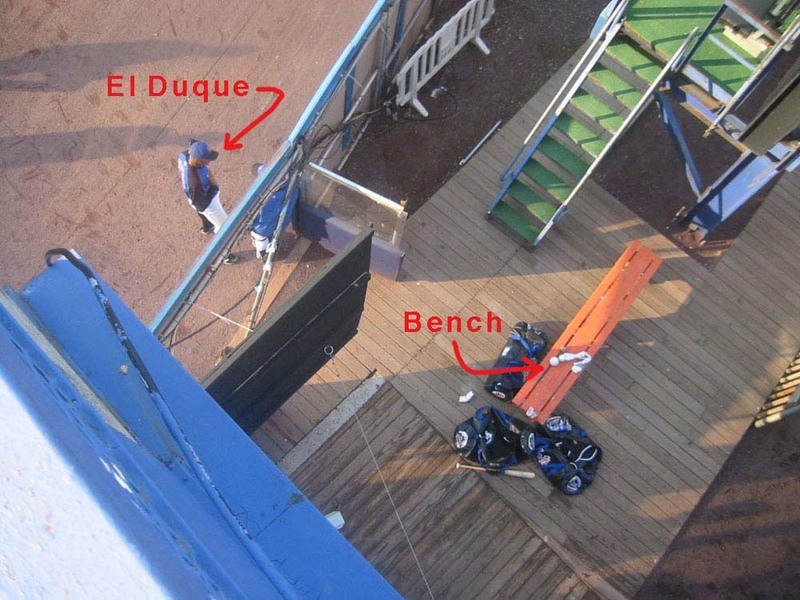 El Duque must’ve forgotten which was which because he promptly grabbed number one and fired it at me–and sure enough, it was one of THOSE balls. I spotted him at the dugout after BP (he’s the one wearing sunglasses), and when I asked him for a ball, he looked around and shrugged and said, “There are none.” Actually, sir, there were three zipped bags full of balls right next to you. Just at that moment, a ballboy walked by with–what else–a ball in his hand. Loria practically grabbed it from him and tossed it to me. Brand new. I mean flawless. 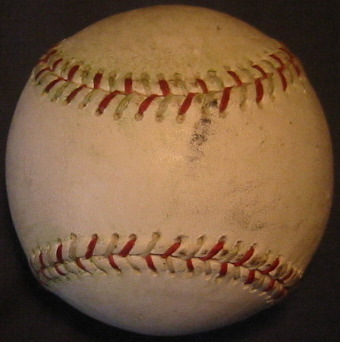 You couldn’t buy a more pristine ball. And then he signed an old Mets-Marlins ticket stub (upside down, of course) that I’d brought. 1) When I asked Girardi for a ball, he looked up and noticed a little kid (without a glove) sitting on my right. Girardi pointed at the kid to indicate that he was going to toss the ball to HIM, but then realized that the kid wouldn’t be able to catch it. “I’ll catch it for him,” I said. Girardi then tossed me the ball, and I handed it over. I don’t count that ball in my collection. 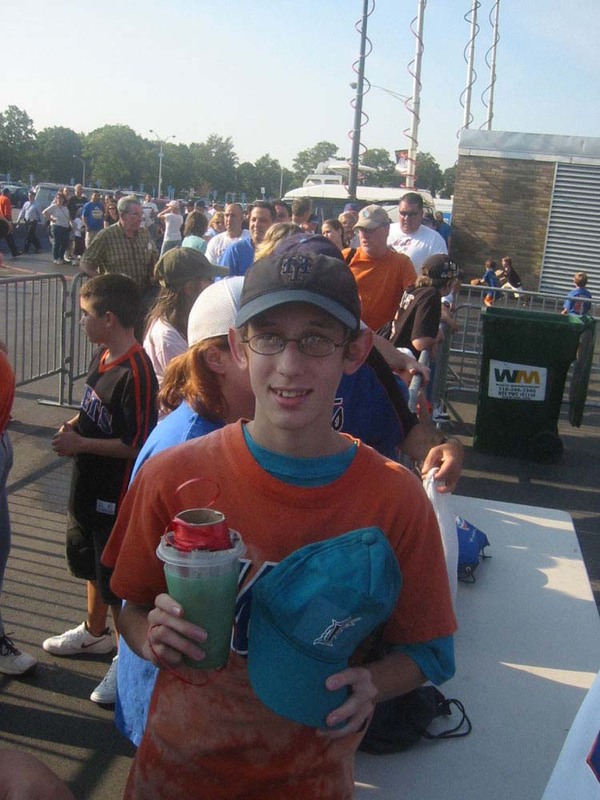 2) An autograph-collecting friend of mine happened to get a ball at the Marlins’ dugout as BP was winding down. It was a bit too scuffed for him to get signed, so he gave it to me. I don’t count that one either. I’m going to take it with me to Philadelphia tomorrow and give it away, most likely to an unsuspecting kid (WITH a glove) who’s actually paying attention and trying hard to get a ball, but just coming up a bit short. 3) As I was heading for the dugout at the end of BP, I heard a distant “Zack!” and turned around and spotted a father and son waving at me from the Loge. I didn’t recognize them. Was it the blurred vision? Or am I just a forgetful jerk? I don’t know. I paused for a moment and waved back and then continued on my way. And then I felt bad. I did, in fact, need to hurry to the dugout to get in position in the front row, but I could’ve taken a minute to go over and say hi. So…whoever you are…I apologize. It wasn’t an intentional diss. I get recognized 20 times a day at Shea (at the very least), so it’s sometimes hard to remember who I’ve actually met in person when there are so many others who randomly shout my name because they recognize me…from wherever. 5) Another Greg (a.k.a. “gregorybarasch” — pictured here with his cup trick outside GATE C) left a comment on my last entry and said he got 11 balls at THIS game. It’s true. He put me to shame. He did have a few extra tricks up his sleeve that made it impossible for me to compete with him, but that doesn’t take away from his monster day. It’s all about outsmarting the competition and coming up with an edge. And he did it. Congrats. Although it’ll make me cringe, I look forward to hearing the details. In terms of foul balls, the game was unbelievably frustrating. I don’t even want to write about it. That’s how bad it was. All I can say is that there’s a certain beer vendor and usher that I wish I’d never have to see again. But the night was still a success. A HUGE success. Steve Trachsel pitched brilliantly and Jose Valentin slugged two homers as the Mets clinched the NL East with a 4-0 victory, ending the Braves’ steak of 14 consecutive division titles. 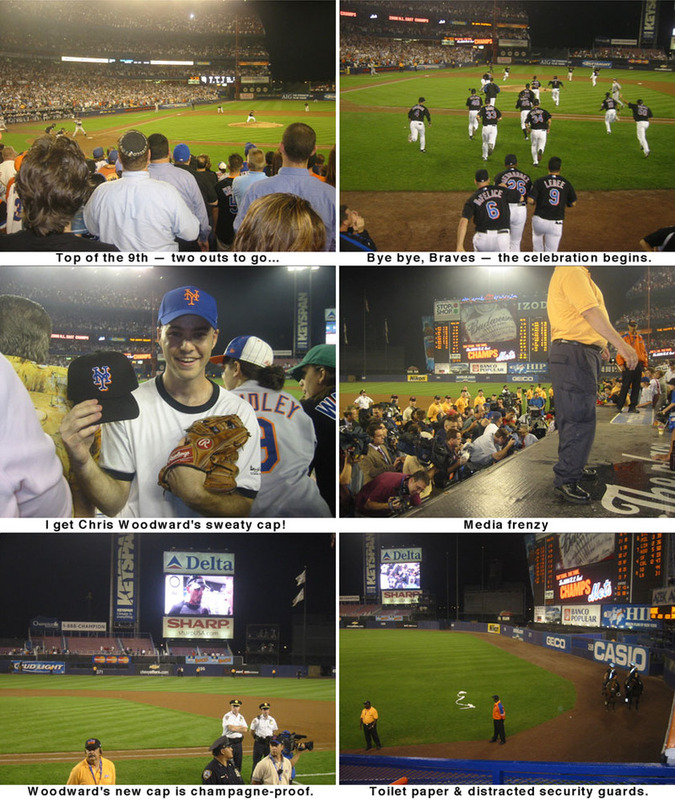 After the first out in the top of the ninth, I had headed back down to the Field Level and squeezed my way through the crowd toward the front row behind the middle of the Mets’ dugout. After the on-field celebration, most of the Mets exited the field at the first-base end of the dugout, and one of the players flung his hat into the crowd. “Oh MAN!” I thought. I’d actually been thinking of going to that side. But then a few of the players veered from the pack and headed straight toward me. Woodward was one of them, and as he approached, I took off my hat and made a flinging gesture, which obviously worked because he took of his hat and flipped it high in the air. Everyone else reached up. I jumped up and reached out, barely snatching it above a dozen hands before belly-flopping on the dugout roof. I was psyched, as if you can’t tell from the picture. I’ve been to 630 games in my life, and this is my first cap ever. It was sweaty and stinky and had Woodward‘s No. 4 written on the inside with a thick black marker. Awesome. So yeah, I only got three balls, but who cares? Do you care? I don’t. • Competition Factor = 140,187. • 185 balls in 26 games this season = 7.1 balls per game. • 4 consecutive games with at least three balls! Wowzers. A hat! I’m waiting for the playoffs like it’s the best chocolate mousse in the world, and I’m Rosie O’Donnell with hunger pains. It must of been fun last night! The hat was neat!! Anyway, sorry about Letterman. Pulled off the ol’ hat trick, eh? Good. You’re on your way to having a player’s complete regalia. Because, see, since you’ve already collected a glove and a bat, all you need to round out the deal are a uniform top, tee shirt, pants, socks and spiked shoes. Go for ’em, dude. Heard you ran into Kip on the train last night – wish I’d been there to say hi as well! BALL #1: Tossed by Billy Wagner within 30 seconds after I reached the Field Level corner spot in right field. He fielded a ground ball five feet from the foul line, I called his name, and he flipped it to me. BALL #2: Two minutes later, a slicing line drive/pop-up was hit near my area. I ran over and caught it after it took two weird bounces off a seat and a step (I think you saw this one). BALL #3: A ball was sitting about four feet out on the little grassy area in foul territory along the stands. I walked up a few rows, set up my cup trick and reeled it in within 30 seconds. BALL #4: After Kelly Stinnett finished catching with either Oliver Perez or El Duque, I asked him for the ball and he tossed it to me. Then I headed over to the left field Loge. BALL #5: Some Mets batter hit a ball out to the area in left field where all the Marlins pitchers were warming up. One of them tossed it about 15 feet to my left but it fell back onto the field. It was tossed around for a minute and was touched by about four different players until Randy Messenger looked up to the Loge and saw my bright teal “uniform” and hat and threw it right to me. BALL #6: Tossed by Taylor Tankersley who also spotted my outfit. BALL #9: … at 6:35, when the Marlins finished BP, Taylor Tankersley shoveled a ball to me that I’d been watching like a hawk ever since Wes Helms misplayed a grounder that one of the coaches hit to him. It rolled about thirty feet deep into the outfield and was sitting just beyond the edge of the warning track in foul territory. I’ve never gotten a ball like that (a player using his glove to sweep it up and shovel it to me all in one motion). BALL #10: A few Marlins position players were catching in front of the dugout. After Miguel Cabrera finished up, he tossed his ball right to me (thanks again, teal Little League uniform). BALL #11: Shawn Green ended the sixth inning(?) with a double play. I rushed down to the Marlins dugout and my timing and location were absolutely perfect (I guess that was the case all day). Mike Jacobs flipped the ball right to me. Everything went right all day long. I got every bounce, I was in perfect position every single time (except for the Shawn Green ball, but that was my height’s fault, not mine), and I was just unbelievably lucky. And this has helped me realize just how good your single-game record of 19 balls is. I couldn’t do anything wrong, but I was still eight balls away from that? That’s unbelievable. How do you do that!? I guess by “a few extra tricks up my sleeve” you mean the outfit, the youth (which always helps), the cup trick, etc.? And again, thanks for making yesterday a lot of fun and I’m sorry if I prevented you from getting a couple balls that you may have had a chance at. Better luck next time. By the way, what was it that Guillermo Mota yelled at you? I saw it happen, but I couldn’t hear what he said. Can you give me some PG13-Rated details? Oh, and too bad about the Letterman thing. Hope the “other thing” (which I’m not allowed to mention) works out for you! But – er – um – (don’t wanna be sexist) but – uh – what do you know about the cup? It’s semantics, but since you referred to “the division”, just for the record the Braves were realigned to the NL East in 1994, so other teams finished first instead of the Mets in the East since 1990 — Phils in ’93, Pirates from ’90-92, etc. hey guys..last night was probably the best night of the year for me, and if i sound a bit cocky and over excited..i earned it..its been a long **** time since i had a good day..well lets start Brewers Cardinals last night..i ran down to the corner spot by the dugout and was sharing it with one of those jerks who sell all their autographs..well my goal was to get edmonds and he wasnt at bp..i managed to get belliard on a chrome card and aaron miles, well i thought another bad day,but wait albert pujols gets out of the cage and walks right towards me in my cheap cardinal hat and signed my omlb (not on the sweet spot) but i dont care ITS ALBERT FREAKIN PUJOLS! he signed about 10 more of balls and pics he made a few comments about all the old guys who were going to run off and putt the balls and pics on ebay..i was so psyced..after everyone went in the clubhouse i went to the bullpen and had gary bennet sign a card before he loosened up anthony reyes.shortly after i ran to the tarp area by the cardinals side and got david eckstein and so taguchi to sign cards, shortly after i got SCOTT ROLEN on the sweetspot of a ball! The whole night and all today i savored the flavor because i doubt that i will ever have a day like that again..ohh yea the brewers won by a walkoff single! Just one minor thing Zack i’m actually 22 :-P But the Babyface i have easily gets me some of the Kiddie Promotion items on occasion. But anyway good going on getting Woodward’s Cap, I left about 15 Minutes after they clinched and missed when Wright and all the rest went on the field after but still it was a great night. Woodward usually signs right before the game when he starts, so I would bring the hat and a silver marker to future games in hopes of getting it signed. The only problem is that he doesn’t start much. Thanks! Congrats on being #1. It WAS fun. But it didn’t feel that way until the end of the night. Bummer about Letterman, yes, but like I said, I got some other stuff in the works that’ll help relieve the anguish. Don’t know about the t-shirt (?! ), but getting a jersey would be a-MAZ-ing. Yeah, w’sup with that? You better have a goood excuse for not being there. True. The three balls were the least important part of the night. D’oh! Thanks for pointing out my mistake. I just fixed it with a simple rewrite. Wow. That is QUITE a day. Congrats, and thanks for taking the time to tell us all about it. I came so close to Pujols a few weeks ago at Shea, but I was chased from the section by an evil security guard who has a special set of rules just for me. I’m really sorry about that. I didn’t think you were 14 or anything. I figured you were still in college…maybe 19 or 20…but still, I shouldn’t have used the word “kid.” No disrespect intended. I’ve since changed the word to “young man.” Hope that’s cool, and thanks for saying something. Great advice. I had no idea. Thank you. in all honesty…who does care about that you only got 3 balls? you got a hat, not just any hat, a hat from a mets player on the day they clinched their first division title since 1988, the game they broke atlanta’s 14-year streak of titles. so the hat is very impressive. gregory-very impressive. a nice selection of players/coaches to add to your list of people to toss you balls. also, by the picture zack took, i now remember you at the phillies game(?) i dont remember. i think that it was. congrats to both of you on big games, and more importantly for the mets on the division! is that the first owner you have ever gotten a ball from? Guillermo said the version of those words that would get bleeped here. Well said. I hadn’t thought about the coolness of the context of the hat until you put it all in perspective. Good question about Loria. I forgot to mention in the actual entry that he IS the first owner to toss me a ball. I appreciate the bonus advice about Woody. I’m having second thoughts, though, about getting the hat signed. I generally like to leave equipment in its original condition, which would mean NOT getting it signed. So I don’t know. 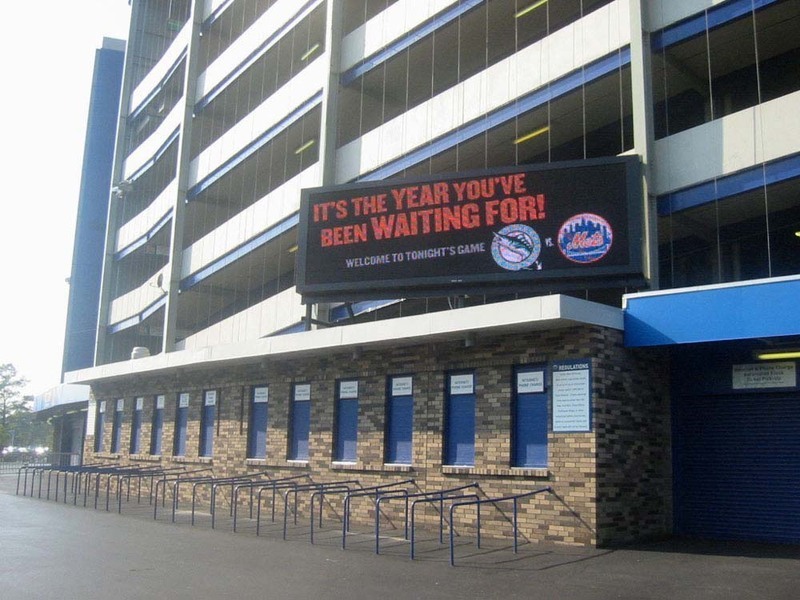 I’ll probably hold off on going for him this year, and anyway, there’s only one or two more Mets games that I might go to. Friday is a possibility, but it’s doubtful. I suppose I might go on Monday, depending on how many balls I’m up to for the season, so you might see me then. I’ll know more by Friday. As for this week, I’ll be in Philly tomorrow and probably in Baltimore on Thursday. I’m going to be running around like a madman for the next few days (with a TV crew in hot pursuit). I probably won’t get to blog about Philly until Friday. Oh no don’t worry about it i knew you didn’t mean it as disrespect. BTW, Me and my Brother have been considering going to PNC Park next year around June are there any places around Pittsburgh that you can recommend prior to gametime in case i go there? So, find any connections for playoff tix?? I think if you contact some of the film crews that have used you before, you could strike some kind of deal. about my ducks game, no pucks caught. Yeah, my excuse was, I didn’t know Kip was going until I got a text message at around 8:30 saying “Valentin just hit his second homer”. Thanks for letting me know that all is well. As for Pittsburgh, I really can’t recommend any places to go because I’ve only been to PNC Park for one game, and that was five years ago. I know nothing about hockey, but congrats anyway on the autographs. I don’t blame you for being pissed, but wow! Five balls despite arriving so late? That’s quite an accomplishment. Thanks for the rundown on how you got ’em all. And thanks for the “good luck” wishes. It must’ve worked because I had a biiiiig night. Hi. “Great” is an understatement. Much to blog about, yes. Thanks for checking in. Hope to see you again soon. In the meantime, give my regards to Joya-oh-Boya. Philly was a huge success, and I might be able to blog about it later today because I’m NOT going to Baltimore. One of the guys in the film crew called the Orioles and was told that there won’t be batting practice, so we’re now thinking about heading down on Friday instead. It’s not definite, but it’s better than 50-50.